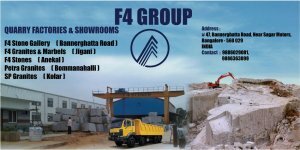 We are one of the well known Granite & Marble industries. We are specialized in providing different types of our products to select over our best quality, including prompt & friendly service, our staffs are well trained to meet many expectations, and Our Company holds the trust of our respected customers for our reasonable services over past & running 4 decades. Established in the year 1973, the company is over 4 decades old. Being in the export market since then we have exported to various countries like Japan, Russia, Europe, and U.S.A, U.K...Etc. Having a complete chain of departments from quarrying to retailing, this also helps us meeting your requirements better and effectively. Our showroom products range from natural stones with the perfection of your choice without disappointing your expectations.